Chances are, if you've tried Hanky Panky Original Rise Thongs, you've become hooked. Friends of mine who aren't even thong wearers have taken a liking to these bad boys. Out of every thong I've ever tried -- and there have been many in my past -- this one takes the cake. Or should I say the candy? My latest Obsession of the Moment is definitely the Hanky Panky "Candy" Original Rise Thong. It comes wrapped up as a tootsie roll -- so utterly fun and adorable, I had a hard time unwrapping and actually wearing it! 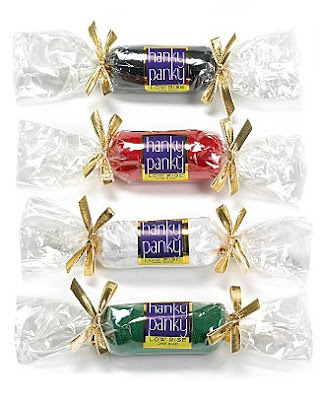 The Hanky Panky "Candy" Original Rise Thong retails for $18.